Let's see. For the most part this week has been relatively low key. A same old same old kind of week. Friday night we went to dinner to celebrate my brother-in-law's birthday. I read one book earlier this week that was a real disappointment, but it really helped me think about what I'm looking for in the books that I seek out to read. It just so happened that the next book I picked up (actually the only book I received this week, shown below) completely blew me away. Making Faces by Amy Harmon turned out to be everything that Mr. President by Katy Evans was missing. Goodreads description--Ambrose Young was beautiful. The kind of beautiful that graced the covers of romance novels, and Fern Taylor would know. She'd been reading them since she was thirteen. But maybe because he was so beautiful he was never someone Fern thought she could have . . . until he wasn't beautiful anymore. 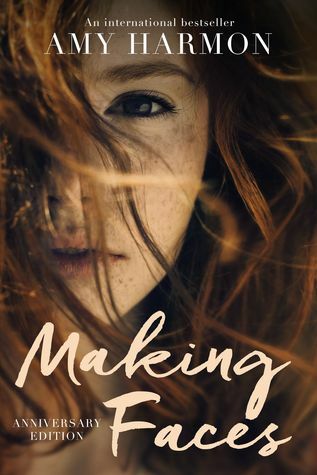 Making Faces is the story of a small town where five young men go off to war, and only one comes back. It is the story of loss. Collective loss, individual loss, loss of beauty, loss of life, loss of identity. It is the tale of one girl's love for a broken boy, and a wounded warrior's love for an unremarkable girl. This is a story of friendship that overcomes heartache, heroism that defies the common definitions, and a modern tale of Beauty and the Beast, where we discover that there is a little beauty and a little beast in all of us. As long as you know how to choose your books you know? It might be like choosing your friends, at least that is how I see it. Maybe that's why I don't have any friends because I don't like them lol I heard about the Radius of Us from Polandbananas Your review was very interesting. Enjoy reading the Throne of Glass series! I kind of devoured them like my food :p too quickly. I LOVED Making Faces!!! I read it when it was an Indie book and it was fantastic, didn't even know it was being re-released. I've only read one other Amy Harmon, A Different Blue, but thoroughly enjoyed it as well. Yay! I hope you had a fun and wonderful dinner! It's always nice to come across a great read after being let down by another. I also had a normal week. Nothing really good or bad happened. I think you're right. Everyone looks for different things in their books (and friends). Yeah, I've gone through periods of my life when most people seemed to just get on my nerves. HAHA! But that's not usually the problem for me with books. Thanks. I'm actually caught up on the Throne of Glass series but I haven't posted my reviews yet because I'm scheduled ahead. Review books keep pushing my reviews of the series back. I definitely read the series quickly. Thanks so much for joining the 2017 Series Enders Reading Challenge! Good luck! Oh it was SO SO GOOD! I highly recommend it! Thanks for stopping by Aneta! Yes, I've added almost all of her books to my TBR list after finishing this one. I was really impressed! Thanks for stopping by and commenting Lenore! Ugh! Tell me about it! Otherwise I would have been walking around ill because the one before was so crappy. :) HAHA! Glad you had a good, normal week too! Thanks for stopping by Laura! Oh it's disappointing when you don't enjoy a book or have a DNF! I'm less tolerant than I used to be, though recently have put aside a couple of books because I could tell it was more my mood than the book that was the problem! Funnily enough, it didn't even occur to me to DNF that one. I'm not sure why. I've gotten much less tolerant as well. I think I wanted to keep reading so that I could write a full review on it. :) But I totally know what you mean about mood affecting how much you're enjoying a book or not. This one definitely the book and not my mood, but it caused me to think a good bit. And ultimately, I think that's a good thing. Thanks for stopping by Deborah! We can't fall in love with every book we read, but there is always the next one to look forward to. Happy reading. So true. Thanks for stopping by Sherry! I do that too. I HIGHLY HIGHLY recommend Making Faces. I hope you get around to it soon (if you haven't already)! Good luck with your challenge! Thanks for stopping by Tanya!